March 9, 2019, Adrian, Michigan – Chaos may best describe how we are experiencing the political, social, and ecclesial world around us. In her workshop, “Chaos – Contemplation – Moving Toward Breakthrough,” Sister Nancy Sylvester, IHM, describes how we can live in this chaotic time in such a way that we move toward breakthrough rather than breakdown. The workshop is from 9:30 a.m. to 4:30 p.m. Saturday, March 23, 2019, at Weber Retreat and Conference Center. 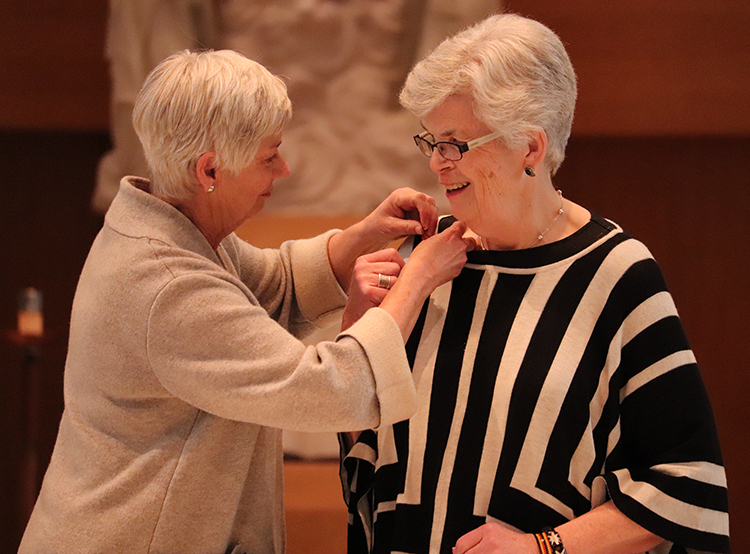 March 8, 2019, Adrian, Michigan – Kathleen Woods, Chair of the Adrian Dominican Sisters’ Portfolio Advisory Board (PAB), was formally accepted as an Adrian Dominican Associate March 1, 2019, during a festive afternoon. The Ritual of Acceptance was preceded by a 45-minute concert by pianist Timothy Hollinsead, husband of PAB member Leslie Watson-Hollinsead. The event was sponsored by the PAB. 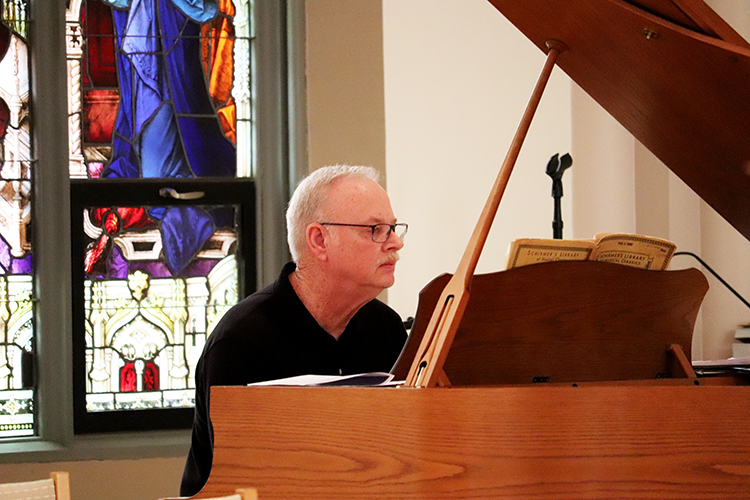 Timothy Hollinsead, a professional concert pianist, performs in Holy Rosary Chapel before the Ritual of Acceptance for Kathleen Woods. Initiated by the Adrian Dominican Sisters more than 40 years ago, the PAB helps the Congregation to live out its social justice commitment through its use of funds. Acknowledging the blessing of the concert, Associate Mary Lach, Director of Associate Life, welcomed the assembly of PAB members, Adrian Dominican Associates and Sisters, and friends to Holy Rosary Chapel on the Congregation’s Motherhouse Campus. “Kathy believes that she has Dominican in her DNA,” said Associate Dee Joyner, who with PAB member Rosemary Martin mentored Kathleen Woods. Rosemary was unable to attend the event. “We suggested that the ‘D’ in DNA stands for Dominican,” Dee added. 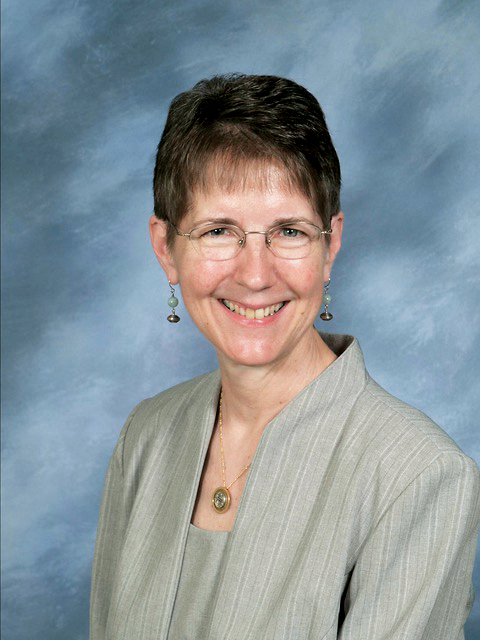 An Adrian Dominican Sister from 1962 to 1977, Kathy first became a member of the PAB in 1975. “With a master’s degree in social work, Kathy has brought to the PAB her vast experience as a clinical social worker and significant leadership experience,” Dee said. “It was the Dominican in Kathy that reached out years ago” to meet the needs of the dying and their families in Chicago. As Director of Home Health and Hospice for Mount Sinai Hospital in Chicago, Kathleen was responsible for developing the first inpatient hospice facility in Illinois, Dee said. Associate Dee Joyner, left, and Kathleen Woods sign the Agreement of Association, a formal document declaring Kathleen’s commitment as an Adrian Dominican Associate. 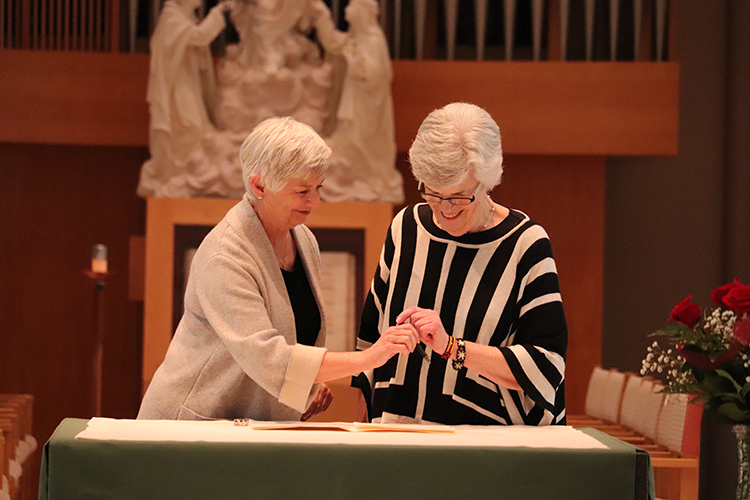 The Ritual of Acceptance continued with the signing of the Agreement of Association, a formal document that states the new Associate’s willingness to enter into a relationship with the Adrian Dominican Sisters and to support and participate in the Congregation’s Mission. Dee then presented Kathy with the Associate Life Logo, and the assembly proclaimed the Vision of the Adrian Dominican Sisters. The commitment of Kathy and all Associates continues until the 2022 General Chapter of the Adrian Dominican Sisters, after which the Associates can choose to renew their commitment. Associates – women and men at least 18 years of age – make a non-vowed commitment to partner with the Adrian Dominican Sisters, living out the Congregation’s Mission and Vision in their independent lives and sharing in the Sisters’ spiritual, ministerial, and social experiences. For more information on becoming an Associate, contact Mary Lach, Director of Associate Life, at 517-266-3531 or mlach@adriandominicans.org. If you are a single Catholic woman interested in religious life – or know of a young Catholic woman who is – contact Sister Tarianne DeYonker, OP, at 517-266-3532 or tdeyonker@adriandominicans.org or Sister Mariane Fahlman, OP, a 517-266-3537 or mfahlman@adriandominicans.org. Feature photo (top): Associates Dee Joyner, left, and Kathleen Woods are all smiles after Kathleen was formally accepted into Associate Life March 1, 2019. Associate Dee Joyner pins the Associate logo on the shirt of Kathleen Woods.